Flying Dutch flag, there is no category of navigation. Only the regulation which governs the category of construction (A to D) is recognized. The category of construction does not limit a vessel to a distance of navigation. This results in no nautical limits flying Dutch flag. Also note that no life raft is required in the security equipment in any navigation zone. You can obtain the title of navigation (flag certificate) within 2 weeks. Possibility of express treatement request. For more details, please see our topic PROCEDURE. For the AMATEUR BUILDING (built by yourself), the title deed is all the main purchasing invoices that have been used for the construction of the hull. There is no control, no test, and no technical file. Although it is recommended for your safety, a life raft is not required flying Dutch flag when operating a boat in any type of navigation (high sea or other). We recommend the range SEA SAFE for which the stations of revisions are represented well by most parts of the world. A French review (Voiles et Voiliers / January 2008 edition – #443) ranks this manufacturer as #1. 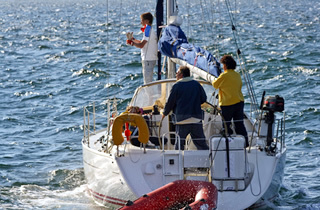 A boating license for recreational navigation is mandatory for steering a pleasure boat that is either a minimum of 15 meters in length or is equipped with an engine and can reach a speed of at least 20 km/per hour. Since May 2011, a Dutch home port will be indicated on your flag certificate. You can choose it freely (Amsterdam, Rotterdam, Den Haag. …). If you have no preference, AMSTERDAM will be indicated. The Dutch port selected must be on the hull of the boat. This has no impact on the berthing areas of the boat. Flag certificate renewal : The Flag certificate is issued with a validity period of 2 years. It must be renewed every 2 years. With our services, the cost to renew is 60 €. For Flag certificates obtained without our services, expect a renewal cost of 100 €.